Moritz is an old brand of beer still present in the collective mind of Barcelona, in spite of the fact that the factory was shut down in 1978 due to financial problems. Moritz became the first big brewery in Spain by 1864 although it had been founded some years before (in 1856) as a small factory in the Raval quarter by Louis Moritz Trautman, an Alsatian brewer. Moritz company came to life again in 2004 and the 1864 brewery of Ronda Sant Antoni was commissioned to famous architect Jean Nouvel for restoration. The place is to become a new leisure and gastronomic project called “Fábrica Moritz” and is due to open in 2007. As a curiosity you should know that the basement of the building is a wonderful sample of XIX industrial architecture according to experts. 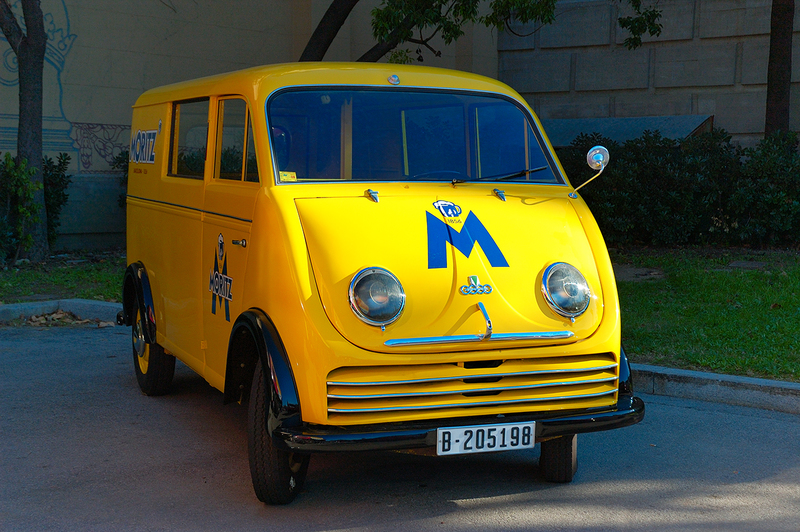 The brand is easily recognizable by a blue M on top of a canary yellow background as seen in this picture of a van at the entrance of Fira de Barcelona venue. The company has reinvented itself not long ago by means of an aggressive and clever marketing campaign that associates itself with major Barcelona city assets. Its most fierce competitors San Miguel and Estrella Damm (featured in Barcelona Photoblog some months ago, see Damm Group post here), are still the predominant brands, especially Estrella, but Moritz is squeezing itself into the little niches big brothers neglect such as a more direct relationship with clients, an impeccable efficiency in production (now you can buy it almost at any bar in Barcelona after only two years of relaunching itself), an attractive design and what's more important an exquisite flavor. Thanks for explaining that, because since I've been living here, people have been telling me that "Moritz is the new beer", and yet it says on the label "150 anys de cervesa" (or whatever it says). Makes sense now. Hello, I present my blog photographs to you on a small city : Martel. in the Quercy (the black perigord in France), the area of the foie gras and the omelette to boletus. mon blog of photographs on the town of Martel. As usual a nice photo. The narrative is interesting too. Today—My house and FAQ photo information.